Staples now offers a full line of OXO GoodGrips office products. No, not the Halloween leftovers. When I say “desk candy,” I mean really cool, ergonomic office equipment. 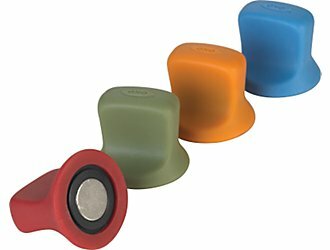 An email from Staples today informs me that they now offer a full line of OXO GoodGrips office products. OXO — the people who brought the smooth-edge (gunk-free) can opener to my kitchen — are now going to expensively restock my desktop. Offerings include the handheld stapler (non-slip grip and 20-sheet capacity); scissors with a box-cutter setting (how well they know me! ); a ruler with sides for drawing and cutting; and a push-pin dispenser with a telescoping magnet wand so you can grab pins without having a mini-acupuncture session. There’s also an intriguing assortment of retractable markers and pens, though nothing to woo me away from the Uni-ball Vision Elite airplane-safe pen. There’s no shortage of OXO products in my kitchen and our bathrooms. Now it will also take over my office! I’ll have to look for these! (Darn it, I was doing so well staying out of office supply stores!) Thanks for the tip, Karen!